The most adventurous corporate accommodation Yorkshire has to offer. 18 luxury sleep pods and two stylish bathrooms. Each enquiry is quoted on an individual basis. Bedroam is ideal for Group Training Sessions, Team Meetings and Marketing Events. 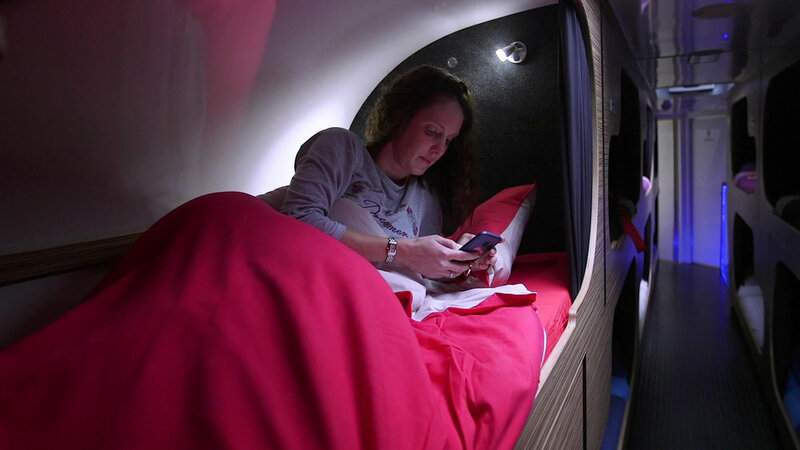 With Bedroam your business teams can enjoy the convenience of sleeping safely on-site in a unique custom built coach that features 18 luxury sleep pods, high quality bedding, 2 stylish bathrooms and a large multi-functional awning. It’s perfect when you want staff to stay close to the work venue and can help save significant time and money. Comfortable memory foam mattresses and black out blinds allow all guests to enjoy a good night's sleep in a sophisticated climate controlled environment irrespective of the weather conditions outside. Personal power points ensure everyone can stay connected 24/7 and the complimentary fridge, coffee machine and audio system further enhance the high specification found throughout. The large awning is equipped with sofas, seating and tables to provide a useful covered space that can be used for group work and relaxation at the end of the day. Separate Male and Female vacuum toilets and high specification showers meet the highest hygiene expectations and ensure that all staff feel comfortable even when sleeping for several nights. Whether you are planning Team Building, Training Courses, Group Meetings or Promotional Events; Bedroam can provide a unique accommodation solution. A great base for other activities such as water-sports, clay pigeon shooting and arts and crafts. Enquire about booking Bedroam for a unique corporate experience. *Prices subject to availability and confirmation at time of booking. Supplements apply depending on overnight location and optional services.